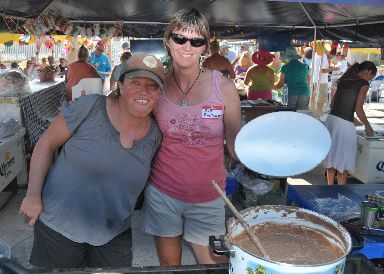 Ahoy from Loreto-Fest in Puerto Escondido! We had a great time at Loreto-Fest, which is a 4 day annual event in Puerto Escondido which brings hundreds of cruisers together for seminars, games, fun, food and of course to celibate my birthday. :-) We've never been to it before, so we didn't know what to expect, but we had a wonderful time. 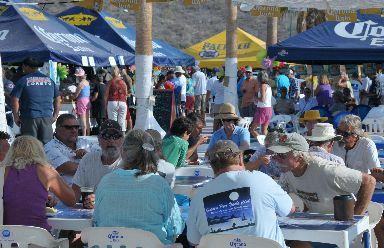 It's put on by the Hidden Port Yacht Club and all of the proceeds go to local charities. Every day they had multiple seminars on everything from radio technology to fishing skills to how to write blogs. There was intense competition on the bocce, horseshoe and other fields. Gordon, from S/V Far Country, was on the winning teams for bocce and over-the-line. There were also seminars on things like jewelry making, cooking and all kinds of crafting stuff. There was lots of musical groups and some local dance groups. Every night they had a band and they even had a Blues band for the Sunday brunch. All in all it was a great time and you can see photos of the event by clicking the link below. All of this relies on volunteers and Sue was front and center helping. She donated a lot of time in the food court and was cooking away for hours. I even spent a few hours helping the kitchen crew out doing clean-up detail. Sue & I even won an award for the Clean-up-the-bay event as we kept going back and asking for another section to clean up. If you're interested, here's a link to the schedule of events. 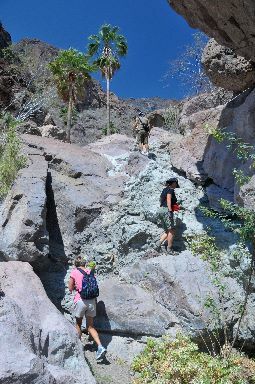 The canyon is a few miles away from the marina and climbs up into the Sierra de la Giganta mountains. We had a guide who had done the hike 7 times before and this was good as there were several places where the trail was far from obvious. This was probably one of the hardest hikes that I've ever been on, requiring squeezing through small holes in the rocks, using ropes to transverse rock faces and lots of scrambling over huge rocks. It was also HOT, with temps in the 90s and very little wind. But, it was a beautiful and we're very glad that we went. We've been here for about 6 days and plan to depart later today for somewhere N (I think) of here. We haven't decided and don't have any schedule, so we'll just have to see where we end up.